The Palestinian Center for Human Rights (PCHR) strongly condemns the attack on three doctors, including a female doctor, during their work. 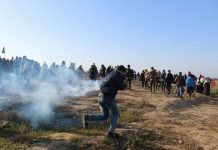 The first incident occurred the day before yesterday, 01 April 2019, when a police officer beat up a doctor and another female doctor in an UNRWA clinic in Beit Hanoun in the northern Gaza Strip. Meanwhile, the second incident occurred yesterday, 02 April 2019, when persons attacked a doctor inside the European Hospital in Khan Yunis. PCHR calls upon the Attorney General to seriously investigate these attacks and to bring the perpetrators to justice. According to PCHR’s investigations, at approximately 12:10 on Monday, 01 April 2019, a police officer broke into the room of Dr. Randa Mansour Ahmed Mas’ud (32) inside Beit Hanoun Clinic belonging to the UNRWA in the northern Gaza Strip, and destroyed some of the room’s contents, “a computer screen and telephone”. The officer also threw a “pencil case” at the female doctor, hitting her head. When he left the room, the Clinic Director, Dr. Tawfiq Zaki Tawfiq al-Ja’bari (59) to see what was going on. He was then beaten by the assailant, so he lost consciousness. The Clinic’s staff took the doctor to the physiotherapy room before transferring him to the Beit Hanoun Governmental Hospital after his condition deteriorated. It was later found that the doctor suffered an angina and bruises. The police then arrived at the scene and arrested the assailant. Commenting on the incident, lieutenant colonel Ayman al-Batniji, the Palestinian Police Spokesperson, said that the police officer in question was detained and referred to the official authorities to take the necessary legal action against him. In another incident, on Tuesday afternoon, 02 April 2019, persons severely beat Dr. Mohammed Kaloub, a vascular consultant, when he on his way out of the European Hospital in Khan Yunis. As a result, Dr. Kaloub sustained direct injuries to the face and body. According to Dr. Mohammed ‘Abd al-Majid Kalloub (46), from Deir al-Balah, told PCHR’s fieldworker that at approximately 13:45 after he left the Gaza European Hospital, south of Khan Younis, he was assaulted by three persons in civilian clothes driving motorcycles. One of them hit the doctor with a sharp object he had in his hand while the other two hit him with their hands in the back. There was a hand fight between them that lasted two minutes before they fled away. As a result of the attack, Dr. Kalloub sustained an injury to his face under the eye and bruises to the right hand and leg. The police then arrived and took a testimony about what had happened as Dr. Kalloub informed them he knew of one of the assailants. Police sources stated to PCHR’s fieldworker that they opened an investigation into the incident. PCHR hereby strongly condemns these two incidents and reiterates its call upon the Attorney General to seriously Investigate them and bring the perpetrators to justice.